She was once one of the ring’s favorite female fighters and now she is one of the favorite female fighters in the octagon. Holly Holm left all of us speechless when she knocked out Ronda Rousey back in November of 2015 with an impressive kick that earned her the UFC bantamweight world title. Holm then had the first defense of her belt against Miesha Tate and lost by submission in surprising upset in March of this year. “The Preacher’s Daughter” returns to the octagon this Saturday, July 23, at the United Center in Chicago and will face Valentina Shevchenko. 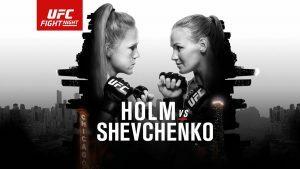 Holm is ranked #2 in her division and has a record of 10 wins and 1 loss, while Shevchenko is ranked number 7 and has a record of 12 wins and 2 losses. Holm has a slight height and reach advantage over Shevchenko whose specialty is Muay Thai, while of course Holm’s strength is her boxing pedigree as she once was a boxing world champion. Holly Holm is the favorite to win and bookmakers have her as a favorite at -250. In paper she is the better fighter, she has a knockout percentage of 70%, her boxing and kickboxing skills make her a dangerous fighter on her feet, she is not comfortable on the canvas and she has great defensive skills. Valentina Shevchenko is not an easy opponent she is a well-rounded mixed martial artist, a good striker too, although not as good as Holm, she also has decent defense and a good grappling technique; with Holm the safer game plan is usually to try to take the fight to the ground, and although Valentina has the tools to pull this off I would expect her to fight on her feet a lot and put her Muay Thai to good use; downside to this plan is that Holm is fast, has good foot work and general movement, and will give Valentina a lot of trouble while standing, the pressure may be too much for Valentina. If Holm gets the win over Shevchenko, she could face next the current bantamweight title-holder Amanda Nunes or perhaps we’ll get the expected rematch with Ronda Rousey or Miesha Tate which would all be great fights and pose a major motivation. In the co-main event we have a lightweight bout between Brazilian Edson Barboza and USA’s Gilbert Melendez. Favorite to win is Barboza with a line of -190. Edson Barboza seems like a very solid bet, he has great kicks and he is a great striker, he is also at a good moment in his career. So my money is on Barboza to win by decision. Log in to AceSportsbook.com today and place your bets on MMA, odds are great for this card, you don’t want to miss out on the action.